Phew! May is one of my favorite months to blog, and I'm totally dropping the ball. It's just been a whirlwind honestly. I can't believe we're almost to the middle of the month... when it feels like it just began! Thankfully though, we took a time out, and drove to Holland to see the tulips last night. It was 70 degrees, warm, and I couldn't wait to get out of work and head to the lakeshore. We stopped to Veldheer Tulip Gardens. We sort of alternate between this place and Windmill Island every year, but this year, the timing just worked out better here! And I'm so glad we came. It was beautiful, and I absolutely LOVE the rows of colorful tulips! 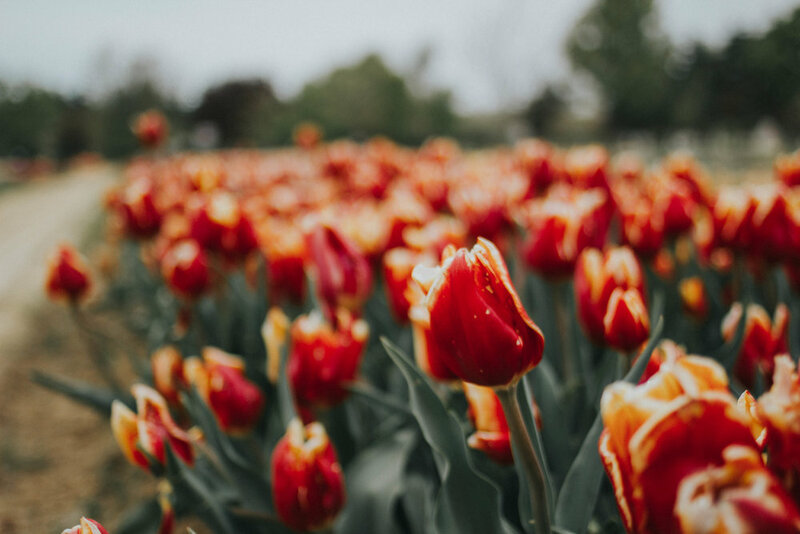 If you live in Michigan, and haven't been to Holland during Tulip Time yet, put it on your bucket list! I did an Instastory of my seven past tulip outfits, and this is the first year I'm wearing JEANS to the tulip fields. It just seems natural to wear a dress amongst such pretty flowers, but I loved this casual folksy look for romping around! When we got inside, we were happy to find it pretty empty! Last year when we went, it was absolutely packed. Buses were dropping off tourists, and it was hard to snap photos without getting in someone's way. This visit was one of my favorites. When Eric and I were leaving, I told him to wait, so I could just stand there, take in the moment, breathe in the scent of fresh dirt and flowers, and I just didn't want to leave. I told Eric that visiting the tulip fields is right up there with picking pumpkins, exploring a new lighthouse, crossing the Mackinac Bridge, the first vanilla cone of summer, the upper peninsula, camping at Torch Lake, our annual trip to Frankenmuth, seeing a tear-jerker in the theater (with buttery popcorn, of course) and chicken alfredo from the Olive Garden. My happy list. After exploring the farm for a while and watching the bison roam (yes, bison! ), we headed downtown to check out Tulip Time and grab a bite to eat. We parked, and headed to New Holland Brewing to grab a table. We had a little bit of a wait, so we stood outside watching the Dutch street dancing. So fun! I love the energy of Holland. It has that true small town feel, which I absolutely love, and is one of the biggest things I miss about living in Grand Haven. Grand Rapids is definitely home, and I want to stay here forever, but there is a big part of me that wants to just move to a small town. Especially one on Lake Michigan. Thankfully we're close enough to head over on any ol' weeknight! I've been trying to eat a bit healthier this week, and get back on track with WW, so I ordered the black bean veggie burger and raw vegetables from New Holland for dinner. I was cranky about it too and wanted the beer cheese dip and the blue cheese burger, but once I got my food, and dug in, it was delicious. It's easy to want to eat crappy junk food, but ordering the healthy food, and truly enjoying how delicious it was, just made me feel SO happy. Between exploring the tulip fields, eating a yummy healthy dinner, enjoying a glass of wine, I just felt so happy when we were driving home in the rain. That is how I always want to feel. Alright... I'm headed off! I went for a quick mile run tonight to prepare for my 5K this Saturday, and it was kind of rough. I think I'm getting a cold, so cross your fingers for me that it goes away and soon! We have a great weekend planned... Eric is playing a couple of shows at fun venues, we're running the 5K, and it's supposed to be beautiful weather! Mother's Day is also this weekend... happy Mother's Day to all of you mamas! Looking forward to the rest of May, and the fun plans that come with it!